Thinking about spring...Hmm. Tulips, daffodils, GREEN! We still have some snow in our yard even though the temperatures have been in the 40's lately. I haven't noticed any substantial buds on our dead-looking trees. I am not very patient this time of year. I want to see green and smell that wonderful scent of spring! If I can't have spring, thank the Lord I have my paintings to look at and enjoy the memories from last year. This painting was done for a couple in my neighborhood. In fact, I pass by this house any time I drive into town. They have always kept such good care of their place and it is charming. I stopped at a garage sale they were having last summer and we began talking. Once they discovered that I painted Garden Portraits, they asked me if I would paint one for them. I was so excited. 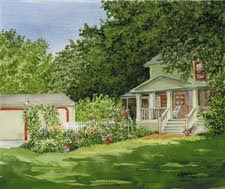 I have always loved their home and it was a pleasure to paint. Their garden along the fence is always changing throughout the seasons and it is so cheerful. Now, when I look at the print that I have of the piece, I can relive the memories of how much I enjoyed painting it!